Any recipe that has “avocado” in the title twice HAS to be good, right? I have a little tale to tell. At bed time, I tell my daughter a story and sing her a few songs. The problem with this nightly routine is that doesn’t just lull my daughter to sleep. Sometimes, I get so cozy and relaxed that I put myself to sleep too. For some strange reason, my daughter was confused (as I was). But we had a good laugh, and now, nodding off is often called “avocado toast” in our house. Yeah. That really happened. The end. The moral of the story is that avocado toast is one of the best things ever and it’s apparently always there, in my sub-conscious. Deservedly so. I don’t care if it’s trendy, I don’t care if it’s considered passe. Avocado toast will always be my boo. So sing it loud and proud, I guess! 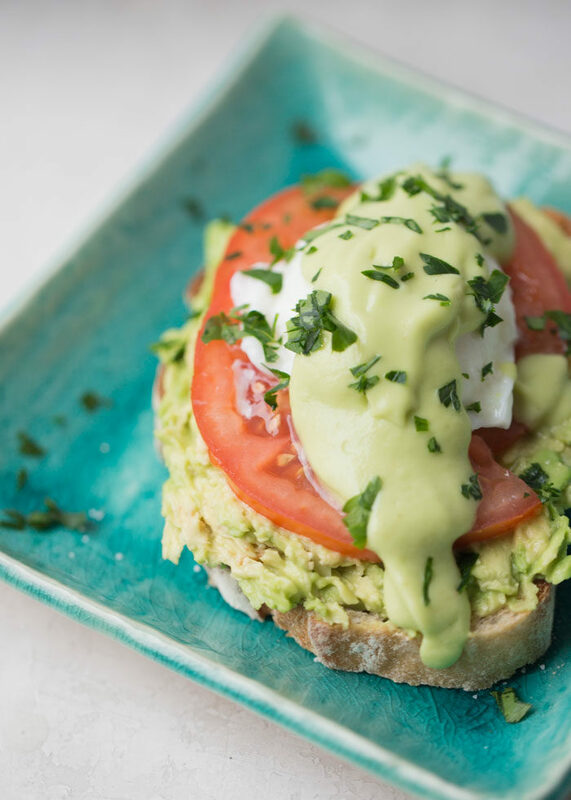 Anyway, this Avocado Toast Eggs Benedict with Avocado Hollandaise is the ultimate avocado-lover’s (me) breakfast. 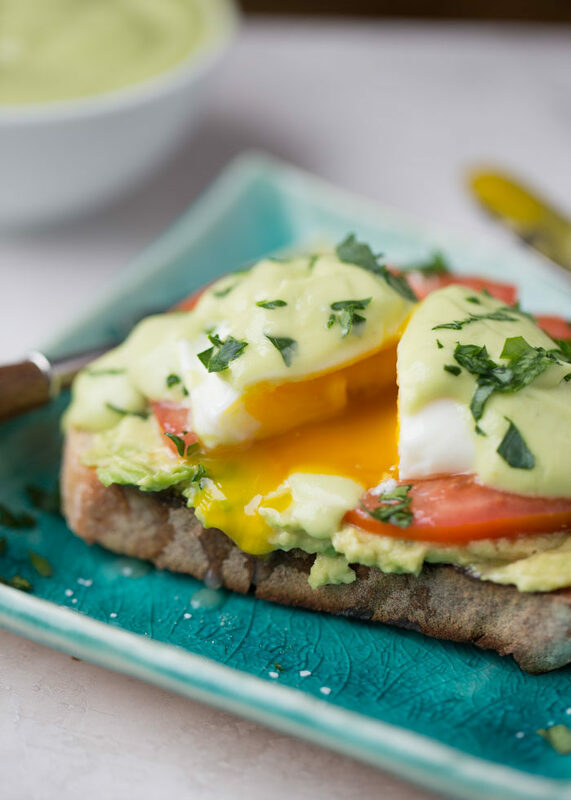 You’ve probably guessed this, but in this vegetarian eggs benedict recipe, but you’ve got avocado two ways. 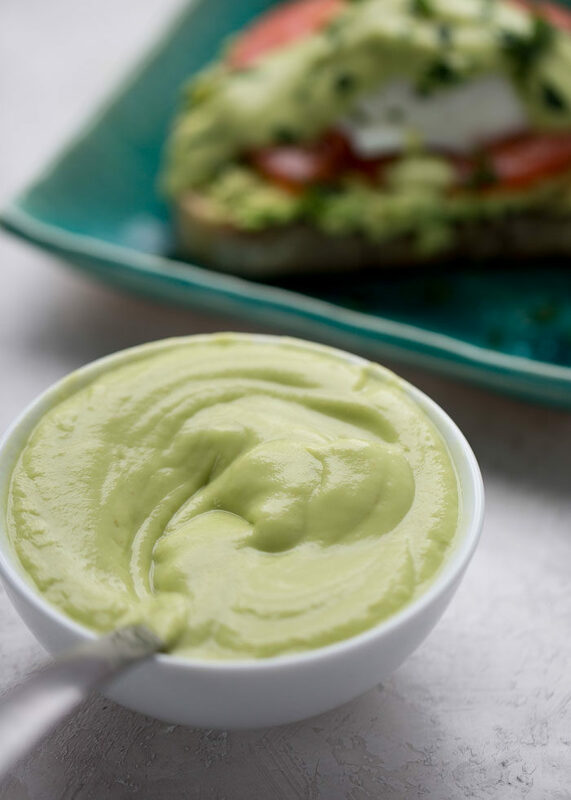 Earlier this week, I shared how to make avocado hollandaise, and if you weren’t quite convinced, well. I’m really hoping you are now. 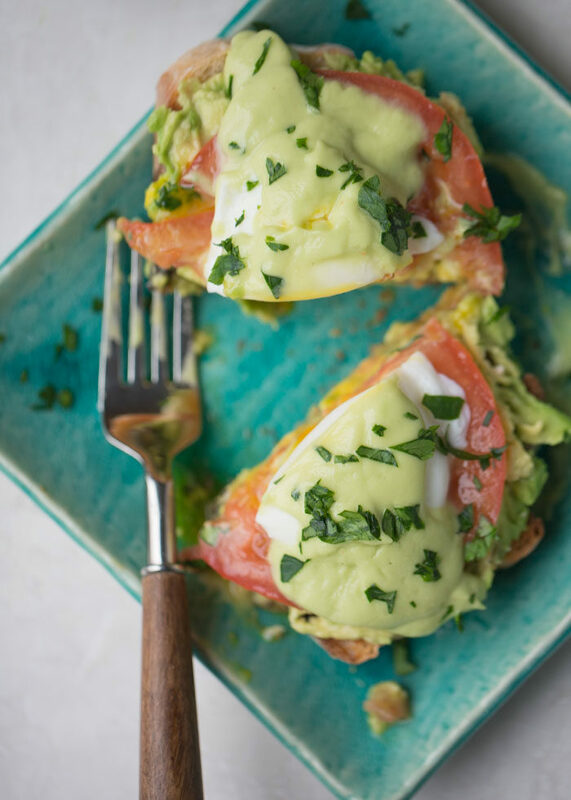 Crusty bread, a layer of mashed avocado, a couple of juicy tomato slices, a poached egg, and that sauce. This is my new favorite breakfast. 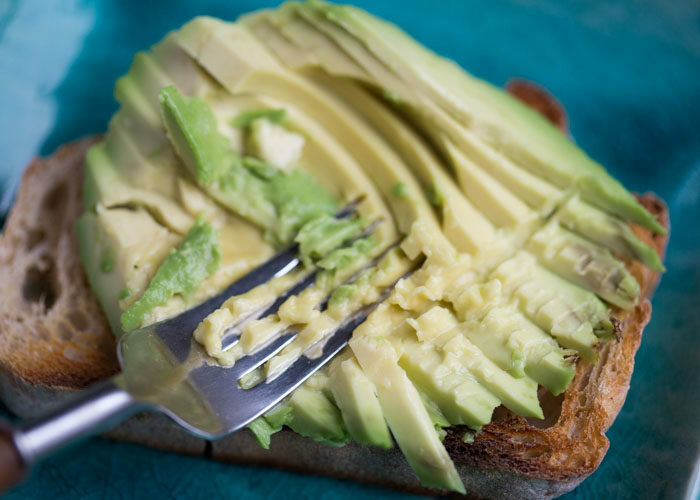 It hits all the marks – some carbs, fiber thanks to the avocado, protein, healthy fats (again, thank you avocado!) Plus, it’s surprisingly easy to put together. Set a medium pot of water over high heat. 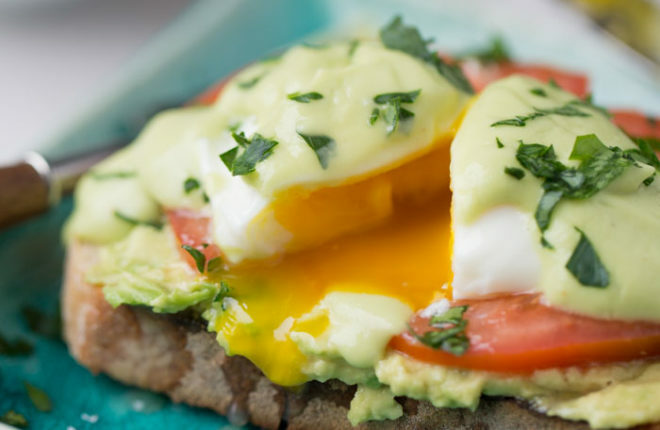 While the water heats, make the avocado hollandaise sauce. Set aside. Toast the bread. Set on individual plates. Half the avocado, remove the pit and peel, and cut each half into thin slices. Lay on the toast, and mash with a fork. Top with tomato slices. Sprinkle with a little pinch of salt and pepper. Poach the egg. By now, your water should be boiling. Reduce the heat to low, until your water is barely moving, with only a few small bubbles rising to the surface. Crack eggs into the water, hovering right over the surface so that the eggs don’t have very far to drop. Cook for 3 minutes for a very runny yolk or 3 1/2 minutes for thicker (yet still runny) yolk. Remove eggs from water with a slotted spoon and place atop tomato. 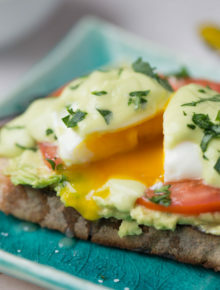 Spoon avocado hollandaise over the top. Sprinkle with parsley and/or chives if using along with a pinch of salt, and a generous pinch of pepper. Swap in your favorite GF bread.